Is love forgiving? A heart-warming retelling of the story of persistent Hosea and promiscuous Gomer.Morgan Sutter, the oldest of three brothers, is headed West to meet his long-lost uncle on his cattle ranch. Morgan is hoping to start a new life, to settle down, and begin a family. What he doesn’t expect is a beaten-up runaway of a woman to stumble upon his camp! Morgan and his brothers resolve to help her in any way they can.The woman is Brianna Tompkins, an ex-high society woman from the East, who has never faced such adversity before. She grew up privileged with servants to cater to her every whim, but now she is faced with destitution unless she agrees to marry the cruel and lecherous Mr. Percy Smythe. When she meets Morgan, everything changes and she begins to have hope for a future filled with love instead.But ranch life isn’t everything she imagines and Brianna finds herself struggling. With no one around who understands the riches she was used to, Brianna feels guilty and terribly alone. Though she tries her hardest, Brianna finds herself too delicate in many ways to handle the rough and exhausting life of a pioneer woman. Until, love provides her with the motivation she was lacking.Wedded bliss leads to an unexpected pregnancy and Brianna finds herself facing her toughest challenges yet. Motherhood, wifely duties, and pioneer life are a heavier burden to bear than she feels like she can manage at times—even with Morgan’s help.And then a series of misunderstandings takes Brianna away from the ranch and Morgan, without hope but to…If you like fast-paced clean romance, inspirational and emotion-packed stories, you won't be able to put down this compulsively addictive Novel by Chloe Carley. 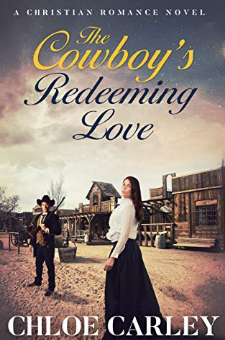 "The Cowboy's Redeeming Love" is a stand-alone Inspirational Historical Romance Novel of approximately 400 pages.Buy "The Cowboy's Redeeming Love" to discover Brianna's inspirational romantic story today!Get this Book FREE With Kindle Unlimited!